Order Project CRISS support products by submitting this order form by fax or email, or give us a call. Note: These are out of print and our remaining stock is on sale. 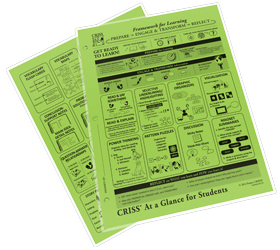 This 8 1/2" x 11" laminated, three-hole punched, two-sided card displays the CRISS Framework for Learning and 24 CRISS strategy "prompts". Sold in packs of ten. Limited license to print available for student handbooks, etc. Please contact the CRISS National Office for information. CRISS for Students I: It’s A Brain Thing ~ Learning How to Learn! This semester-long curriculum is a learning principles and strategies class appropriate for students in grades 5-9. 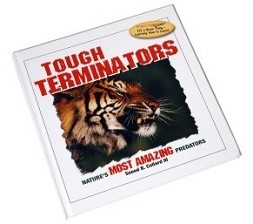 The course guides students through a series of CRISS learning plans based on Tough Terminators by Sneed B. Collard III, a trade book about predators, and an informational video (DVD) about animals in northwest Montana from the Critterman's World series. Learning plans start out very teacher-directed. As the semester progresses, students start making their own strategy selections, and finally, students complete learning plans by themselves. Throughout all lessons, the students are required to apply the strategies to their other content classes. In fact, we recommend that the CRISS for Students teachers allow students to use class time to practice strategy use and develop plans for working on assignments in other classes. It’s a Brain Thing can be used as an advisory or literacy support course, or as a supplement in a core reading, language arts, or science course. For greatest impact, this curriculum should be facilitated by a CRISS-trained teacher. The classroom curriculum includes the Teacher Wraparound Edition with a Critterman DVD, student copies of Tough Terminators by Sneed B. Collard III, and a license to print the 222 page student workbook. To preview sample pages of the curriculum, click here. Tough Terminators: Nature’s Most Amazing Predators by award-winning science author Sneed B. Collard III, takes a unique look at twelve of nature’s perfect predators – with up-close photos, illustrations by students, range maps, and Fantastic Facts. Discover how you can help protect these animals and their habitats around the world. 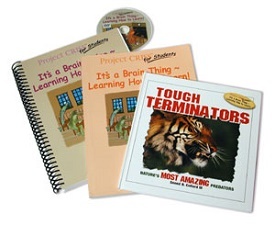 Tough Terminators is a companion piece to the curriculum for students in grades 5-9, CRISS for Students I: It’s a Brain Thing ~ Learning How to Learn! by Lynn T. Havens and Bonnie J. Valdes. CRISS for Students II: LEARNING To Succeed is a flexible curriculum designed to teach the CRISS learning principles and strategies directly to students in grades 8-12. The course uses the CRISS Keys to Learning, principles derived from cognitive psychology and brain research, and guided application of high-impact strategies to untangle the issue of global warming presented by award-winning science author Sneed B. Collard III in his book, Global Warming: A Personal Guide to Causes and Solutions. In each lesson students reflect on the content learned and the processes used for learning; they identify strategies that work for them and write about how they can use those strategies in their other classes. Students collect applications of successful strategy use to put into their LEARNING To Succeed portfolios for future independent learning activities. LEARNING To Succeed can be used in a variety of situations. Teachers may use all chapters or focus on those that make the most sense for their students. For example, reading teachers may choose to target the chapters dealing with the Keys to Learning. Science teachers might prefer to use the lessons devoted to global warming. This curriculum may be used in a stand-alone study skills or reading class, as a literacy component of a Freshmen Experience course, for a science unit dealing with global warming, in a summer school reading or literacy skills class, or as a supplement for guided strategy instruction through the use of individual chapters. The curriculum is intended for all students, not just those with special needs. Within the Teacher Wraparound Edition, we have provided guidelines for differentiation - lesson modifications for high and intermediate ability students and for struggling and English language learners. 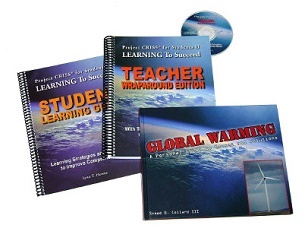 The curriculum set includes the Teacher Wraparound Edition, 30 Student Learning Guides (reusable or consumable), and 31 copies of Global Warming: A Personal Guide to Causes and Solutions hardcover books; the set price includes an 18% discount. Each piece is also sold separately. To preview sample pages of the Teacher Wraparound, which includes embedded pages of the student learning guide, click here. 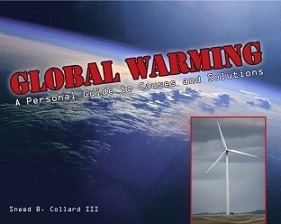 Global Warming: A Personal Guide to Causes and Solutions by award-winning science author Sneed B. Collard III, clearly explains the roots of global warming, its implications for our planet, and the choices we all have for solving one of the most serious environmental problems of the twenty-first century. Booklist Online says Global Warming is, “An excellent choice for school and public library collections.” This book has broad appeal for students, teachers, and the general public looking to inform themselves on the legitimate issues surrounding the issue. Global Warming is a companion piece to the curriculum for secondary students, CRISS for Students II: Learning to Succeed, by Lynn T. Havens. To preview Global Warming: A Personal Guide to Causes and Solutions, click here.